Example programs in C++, Java and Labview for using a limelight camera to drive up to a goal in Deep Space. The 2019 FRC game Deep Space has vision targets above many of the goals that you need to drive up to. Below you can find complete example programs in C++, Java, and Labview which implement a simple method for automatically driving a differential drive robot to a goal in Deep Space. These are very simple programs and only meant to show the concept of using limelight tracking data to control your robot. In each program, you can drive your robot with a gamepad. If you hold the ‘A’ button down, and the limelight sees a valid target (depending on the settings in your pipeline) then the robot will automatically drive towards the target. Be careful to tune the various constants in the code for your particular robot. Some robots turn or drive more easily than others so tuning the proportional control constants must be done on a case-by-case basis. Also make sure the robot drives correctly using the gamepad controller before enabling the limelight seeking behavior. You may need to invert some of your motor controllers. * used for any initialization code. * autonomous, teleoperated and test. * LiveWindow and SmartDashboard integrated updating. * SendableChooser make sure to add them to the chooser code above as well. * This function is called periodically during autonomous. * This function is called periodically during operator control. * based on the tracking data from a limelight camera. // These numbers must be tuned for your Robot! Be careful! 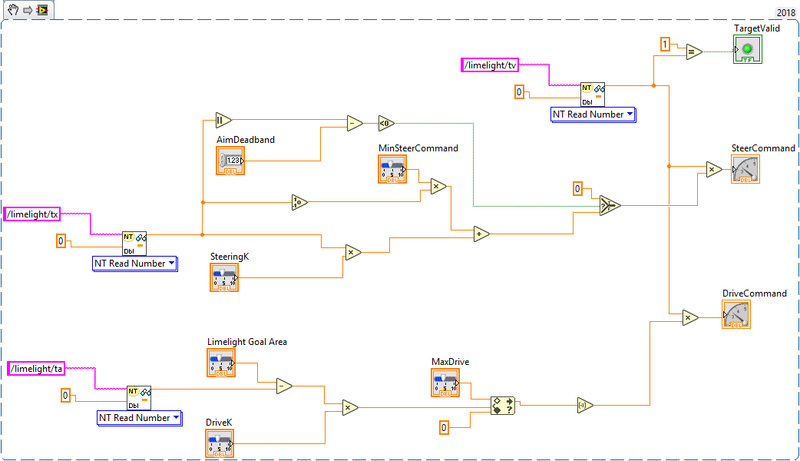 Here is a block diagram for a LabView VI which reads tracking data from a Limelight and generates drive and steer commands. This image is a “LabView Snippet”. Just save the image file to your computer and then drag it into a labview VI and the block diagram will be reproduced.